Hello Friends! It's time for another fun challenge from MelJen's Designs! First, let me say a big THANK YOU to all who participated in our 200th Challenge Blog Hop Celebration last week! We were so excited to hear from all of you! Winners will be announced on Monday, March 17, so make sure you check back to see if you won the GRATS digital stamp that I used on my celebration card. Take another look at it HERE. I decided to use the sweet little Lucky Duck on my card today. I just love his little face. Isn't he just the cutest thing?! I printed him onto my favorite card stock, die cut it, then colored him with Copic markers. I chose a really simple layout for him, because he needed to be the star of the show! I added lots of sparkle to him, using a glitter pen and glitter. After I adhered him to the card base, I embossed the sentiment with brown embossing powder, added a die cut shamrock, which I brushed with my Clear Wink of Stella, then finally, glued on a few delicious Pretty Pink Posh Gold sequins to really make it sparkle and shine! For the inside of the card, I used the same layout I used on the front. I didn't leave a lot of room for a message on this, did I? Well, I thought that the sentiment said it all and all that needed to be added was a short hello and a signature. :) Does anyone besides me actually send out St. Patrick's Day cards? So that's all I have for today. Please take a moment to visit the Design Team blog to see what the other ladies have created to share with you. I hope you can join our challenge, just remember to use a MelJen's Designs digital stamp on your project, so you can be included in the random drawing for FREE digital stamps. How sweet!!! 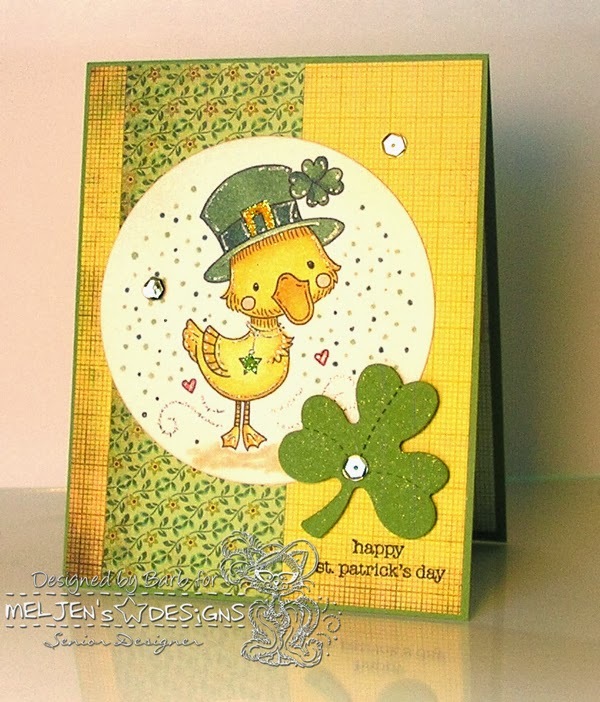 I love the yellow & green combo...fabulous card! Lovely work, Barb! You're right, that image is adorable and you've done an excellent job making him the star of the show. I love how you always find a wonderful way to showcase your image and add your signature sparkle! Love the blessing! Sweet card, Barb. 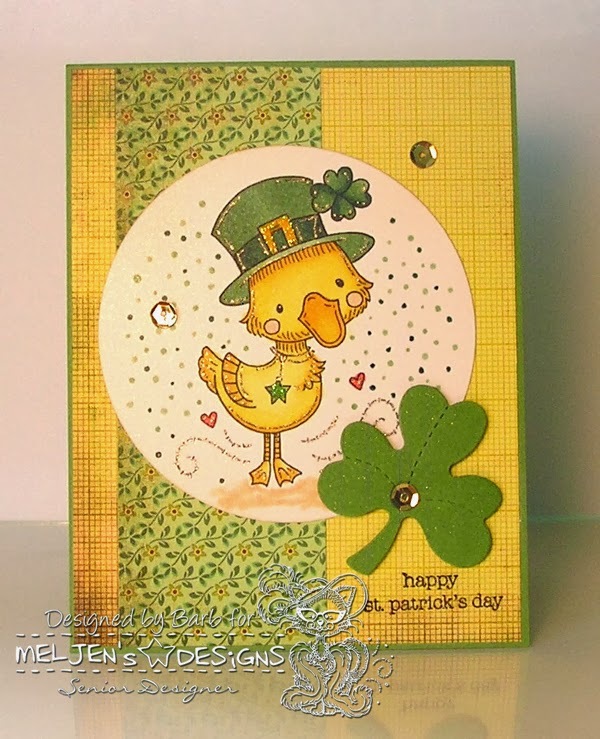 The design and colors are dazzling :) I don't send out St. Patrick's Day cards, but I like looking at them.